Every Friday is Cougar Red Friday at the University of Houston. We wear red on Fridays to demonstrate our unity, pride, and passion for the University. Now, UH students have one more reason to show school spirit! 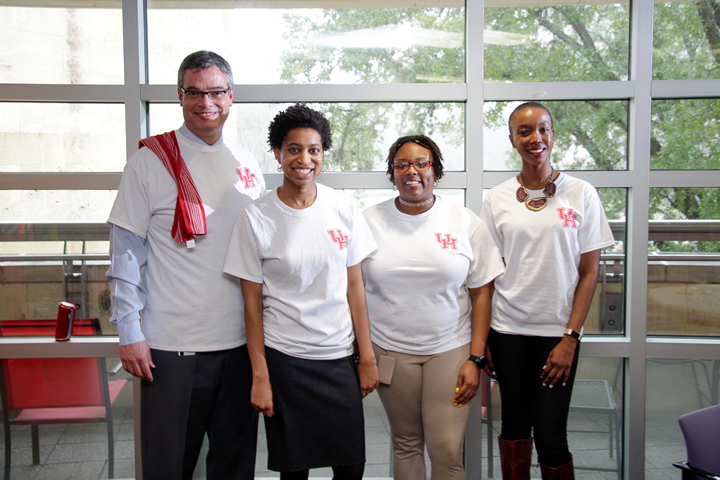 During March Cougar Red Fridays, UH students are encouraged to wear red in the library and enter to win prizes. Snap a selfie and share to Facebook, Instagram, or Twitter with the hashtag #CougarRedLibrary. That includes the MD Anderson Library or any of the campus branches, including the Music Library, the William R. Jenkins Architecture and Art Library, or the Health Sciences Library. You’ll be entered to win Amazon gift cards and Libraries swag. Contest dates are March 2, March 9, March 23, and March 30. Entries should be posted between 12:00 a.m. and 11:59 p.m. on contest dates. Winners will be randomly selected. The following is a guest post by Stephanie Lewin-Lane, Music Library coordinator at the University of Houston Libraries. This week, we’ll feature posts by members of the UH Libraries Copyright Team highlighting Fair Use/Fair Dealing Week 2018. Boston Public Library (BPL) recently announced plans to digitize and make available over 200,000 recordings of their Sound Archives Collection through a partnership with the Internet Archive. Many of BPL’s recordings are on historical formats, such as vinyl LPs or shellac-based 78s, so the impetus for the project is preservation. It is fair use for libraries to create a preservation copy of at-risk materials, but streaming content has been a bit more problematic due to copyright protections. However, more examples of making streaming content available online are cropping up in recent years citing fair use due to the educational nature of the hard-to-find content. In fact, the Library of Congress has a web page that discusses fair use and preservation with a helpful list of links and examples on the subject. The following is a guest post by Taylor Davis-Van Atta, digital scholarship coordinator at the University of Houston Libraries. This week, we’ll feature posts by members of the UH Libraries Copyright Team highlighting Fair Use/Fair Dealing Week 2018. The use of famous figures’ words or images as marketing devices is nothing new, but during this year’s Super Bowl, Chrysler took the practice a bit too far. 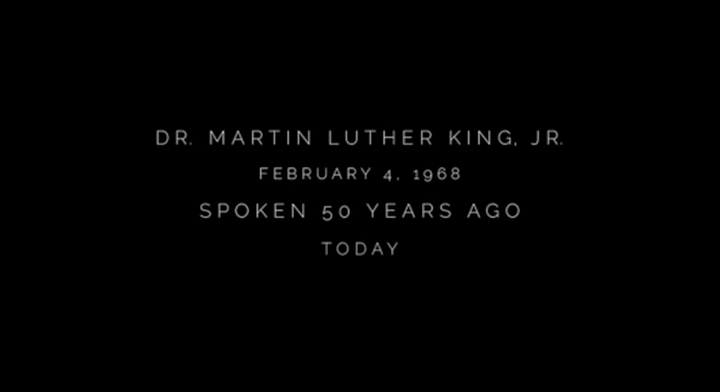 The car manufacturer used an audio recording of Martin Luther King, Jr., delivering a sermon about the importance of leading a life of service as part of an ad promoting its Dodge Ram truck. Though Chrysler obtained permission to use the recording from Dr. King’s estate, which owns the copyright to his works, the decision to use the civil rights leader’s words to market a truck struck many viewers as tone deaf. View the original commercial as well as a selection of responses on Twitter. Robinson’s version of the ad, which appeared on YouTube, was apparently flagged and removed from the site by the platform’s Content ID system, an automated system designed to detect and delete videos that contain materials (audio, video, words, or images) that infringe on copyrighted works. However, because Robinson uses King’s words to criticize or comment on an existing work (the original ad) for noncommercial purposes, his video falls squarely within the provisions of Fair Use, and the video has been restored to YouTube. Enjoy. The following is a guest post by Julie Grob, coordinator for instruction in Special Collections at the University of Houston Libraries. This week, we’ll feature posts by members of the UH Libraries Copyright Team highlighting Fair Use/Fair Dealing Week 2018. Fair use doctrine allows a songwriter to use a limited part of an existing song in the creation of a new work. When assessing a legal defense based on fair use, one of the considerations that judges take into account is whether or not the new use is “transformative.” Such was the basis of a ruling by a New York federal judge in favor of the rapper Drake and his 2013 song “Pound Cake,” from the album Nothing Was the Same. Such a finding is rare in songwriting cases. University of Houston students can record an original song for a chance to win UH Libraries’ first-ever student song competition. 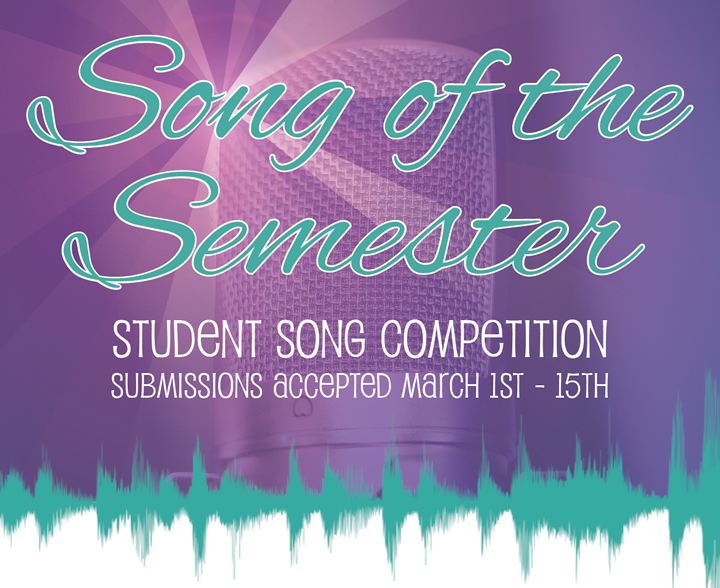 Song of the Semester submissions will be accepted between March 1 – 15. Prizes for 1st, 2nd, and 3rd place will be awarded, including airplay of the winning song and a personal interview with Coog Radio, and iTunes/Google Play gift cards. All submissions must be recorded using the Libraries’ Hamill Foundation Multimedia Studio. All submission forms must be received and approved by 11:59 p.m. on March 30. Contact the library’s Service Desk or Technology Consultation Room for more information. Consultation and submission forms are available here. 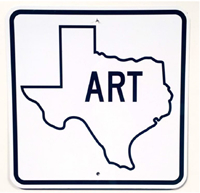 ART Texas Sign 2017 by Alton DuLaney. Reflective vinyl on metal. The William R. Jenkins Architecture and Art Library is pleased to present ART SIGNS by Alton DuLaney. The exhibit will be on view through March. DuLaney is a third-year graduate student in Interdisciplinary Practice and Emerging Forms at the University of Houston School of Art. Alton DuLaney is an Artist who makes ART. Through self-promotional self-expression, DuLaney researches art’s ability to transform the perception of objects, images, actions, producing interdisciplinary art focusing on the power, pride, and patriotism communicated through artistic expression, and the identity of the artist. Signs, inanimate yet capable of communicating instruction, are prevalent in his work, as is text: the word ART always appears as subject, theme, and title, tautologically expressed through a variety of mark-making techniques. DuLaney has performed and exhibited his work in Austin, Houston, Marfa, New Orleans, NYC, LA, Miami, Berlin, London, Copenhagen, Paris, and Rio de Janeiro. A native of Splendora, Texas, DuLaney is currently the Art Director of James Surls’ Big Studio at Splendora Gardens, and in 2017 was elected to the Splendora City Council. DuLaney can also be seen promoting creativity on national TV as the World’s Most Famous Gift Wrap Artist. University of Houston Libraries kicked off its faculty and staff giving campaign, “Hyped Up 2 Give!” with a pop-up cafe in the Staff Lounge. Espresso, coffee, tea, and treats were served to motivate Libraries staff to contribute to the University’s Here, We Go Campaign. The University of Houston Libraries will host the Houston + Feminism Wiki Edit-a-thon. This is the second year for the event at the University, which focuses on creating and improving Wikipedia pages related to gender, women, and feminism. The Houston + Feminism Wiki Edit-a-thon, scheduled for February 28, will bring together participants who are interested in editing and writing high-quality wiki articles. The event aims to raise the representation of women and feminist topics on Wikipedia. Attendees will receive practical instruction on wiki writing, and learn about the importance of diversifying the historic record being created on Wikipedia. During the edit-a-thon, attendees will be given a list of suggested biographical Wikipedia pages to create or enrich and can also choose their own topic. We will also provide information resources relating to the UH Special Collections Carey Shuart Women’s Research Collection. The edit-a-thon will be held from 4:30 – 7:30 p.m. in the MD Anderson Library Blue Wing, Room 106R. Participants are welcome to arrive and depart at their convenience. A limited number of laptops will be available; attendees are highly encouraged to bring their own. This event is open to the public. A new exhibit at the University of Houston Libraries features artwork by Nick Vaughan and Jake Margolin, and is based in part on images found within UH Special Collections. 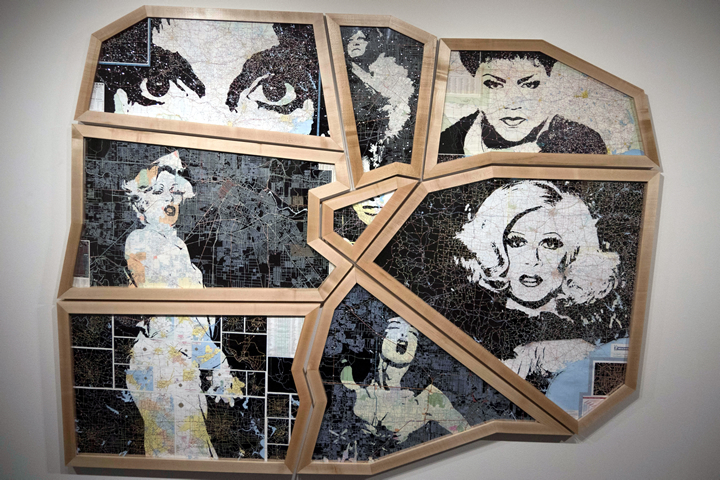 The Scene (Houston: 1969-1981) consists of eight hand-cut found road maps based on photographs of Houston drag queens. The pieces fit together to make a large map of Houston. Simultaneous exhibitions with excerpts from The Scene are currently on display at the UH MD Anderson Library and Tony’s Corner Pocket through February 28. The complete exhibition will be on display at Devin Borden Gallery beginning March 30. The Scene provides a glimpse into Houston’s diverse and thriving drag scene in the years between Stonewall and the beginning of the AIDS crisis, and reflects on the city’s historic and underappreciated role as a destination and refuge for LGBTQ citizens in the Gulf Coast region. Combining images of several of Texas’s most legendary drag queens (Naomi Sims, Mr. Tiffany Jones, and Donna Day) with less well known and amateur performers from the 1970s, The Scene celebrates the integral roll that Houston’s drag community played and continues to play in the LGBT rights movement. A University of Houston Libraries team has published an article in Collaborative Librarianship. Ariana Santiago, Emily Vinson, Esmeralda Fisher, Ashley Lierman, and Mea Warren co-wrote “LinkedIn at the Library: A Continuing Collaboration” which presents methods for turning a one-time, microgrant-funded event into a popular and recurring program in partnership with University Career Services.